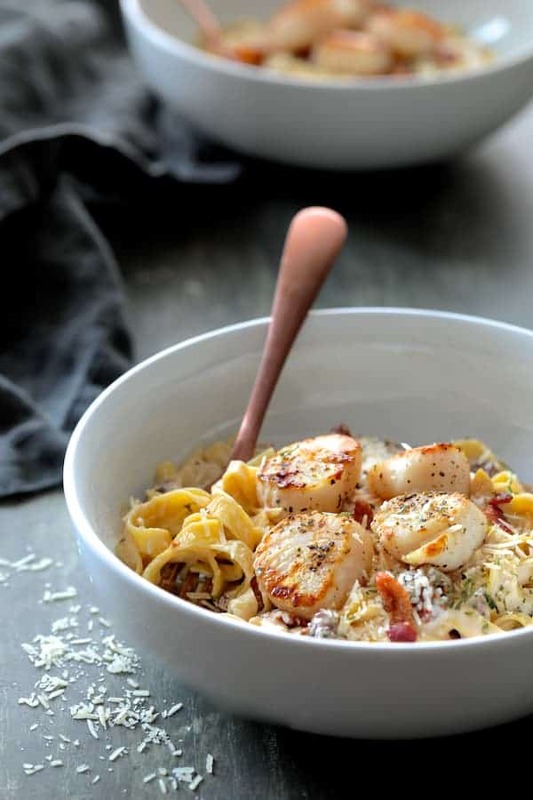 Seared Sea Scallops with Spicy Bacon Sun-Dried Tomato Alfredo Sauce and Tagliatelle made with Bertolli® is easy and perfect for an Italian-inspired romantic dinner for two! Not sure if you’ve noticed or not with my last couple of posts, but lately I’ve been in an Italian frame of mind. My husband and I are contemplating a trip to Europe at some point this year that will include Italy. I’ve been extremely fortunate to have traveled to Italy twice and have been yearning to go back. Italy really gets into your soul! One trip to Italy was a culinary tour with a group of personal chefs. We cooked, we laughed, we ate! The other trip was with my husband and we missed seeing a lot. For one, we were in Florence and never got to see Michelangelo’s David. Who goes to Florence but doesn’t see one of the most spectacular masterpieces ever sculpted? We didn’t get tickets ahead of time and the line to get tickets was several blocks long. In Rome, we didn’t see the Sistine Chapel. Who goes to Rome but doesn’t see the Sistine Chapel? We got to St. Peter’s Square just in time for the square to close early in the afternoon because it was already too crowded. Ugh. Only us. We did, however, agree that not seeing these two historical treasures gave us reason to make a trip back. This may be the year! If a trip to Italy is not in your future, how about a quick culinary escape with the help of Bertolli®? All Bertolli® products have deep Italian roots. In 1865, Francesco and Caterina Bertolli began selling regional wines, cheeses, olives and olive oil from their small grocery store in Lucca, Tuscany. Then, as Italians began emigrating to America, they longed for their native foods and requested Francesco Bertolli send his famous olive oil to them here in America. Fast forward to today and the Bertolli® way is still the Tuscan Way! The Tuscan Way means a few quality ingredients are minimally cooked with olive oil to lock in their exceptional flavor. Bertolli® pasta sauces bring Tuscany to your table! Their organic sauces are made with the finest organic non-GMO ingredients like plump, ripe and juicy tomatoes, extra-virgin olive oil and cheese for a deliciously bright and fresh-tasting pasta sauce. 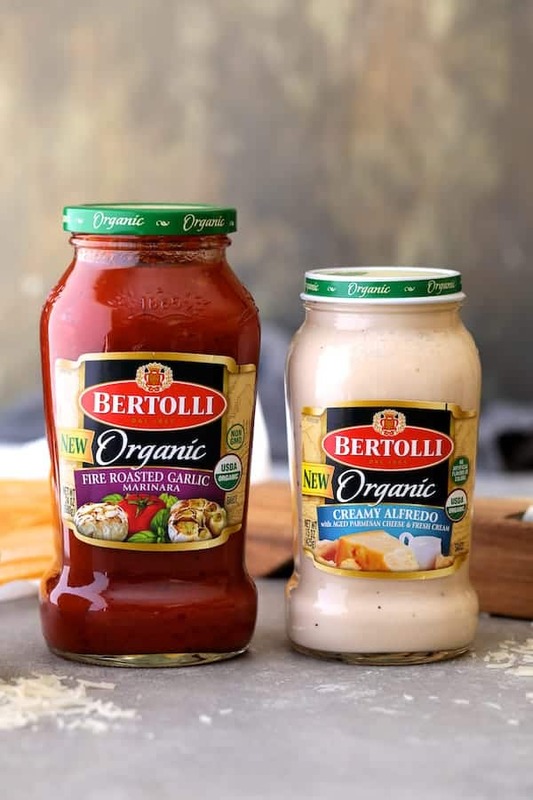 This focus on quality ingredients is their guiding philosophy for how Bertolli® makes all their pasta sauces including their NEW Bertolli® Organic Creamy Alfredo Sauce. 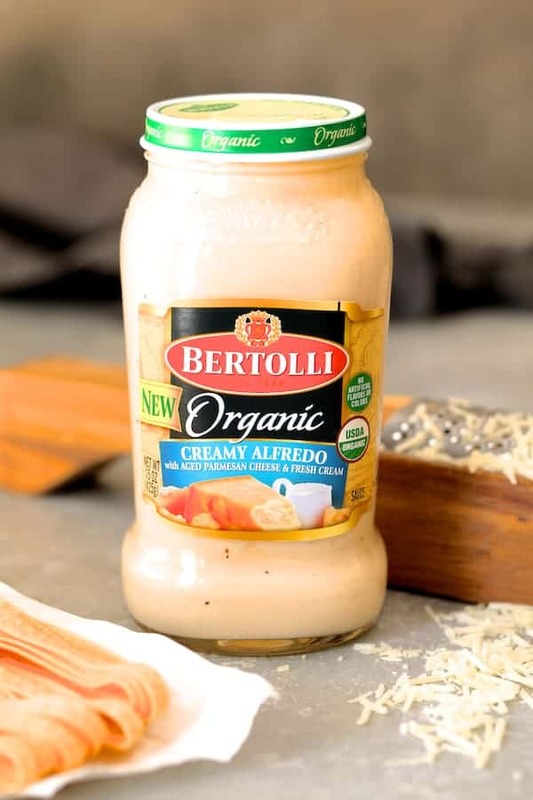 Bertolli® Organic Creamy Alfredo Sauce is one of the first nationally-branded fully USDA ORGANIC Alfredo pastas sauces. NEW Bertolli® Organic Creamy Alfredo Sauce is made with 100% fresh, natural organic cream, milk, real butter and aged Parmesan and Romano cheeses to bring a rich, authentic Italian flavor to your table. Want to add even more Italian flair to your table? NEW Bertolli® Organic Creamy Alfredo Sauce can be combined with Bertolli® Organic tomato sauces to create a unique and customizable “Rosa” sauce. Or, add a touch of creaminess to other Bertolli® sauces such as the Bertolli® Organic Fire-Roasted Garlic Marinara Sauce with the Bertolli®Organic Creamy Alfredo Sauce. So, onto this wonderful Seared Sea Scallops with Spicy Bacon Sun-Dried Tomato Alfredo Sauce! I used the NEW Bertolli® Organic Creamy Alfredo Sauce as the base for this lovely dish, added sun-dried tomatoes, a little bacon and crushed red pepper flakes for a touch of heat. Use sea scallops that do not have any added ingredients or preservatives (also known as “dry” packed). Remove any connective muscle still attached to the scallop as it can become tough when cooked. Rinse briefly to remove any grit. Pat them dry before searing. The is a super easy recipe and the sauce comes together quickly! 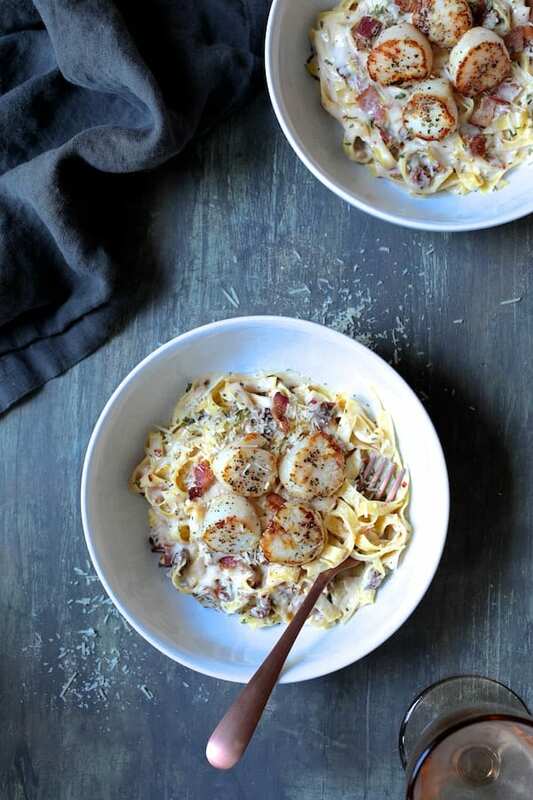 After cooking the bacon and the pasta, simply place the Bertolli® Organic Creamy Alfredo Sauce in a saucepan, add fresh garlic, sun-dried tomatoes, some of the bacon and crushed red pepper flakes. Add the pasta back to the sauce then sear the scallops…. …And this easy, beautiful seared sea scallop dish is DONE! 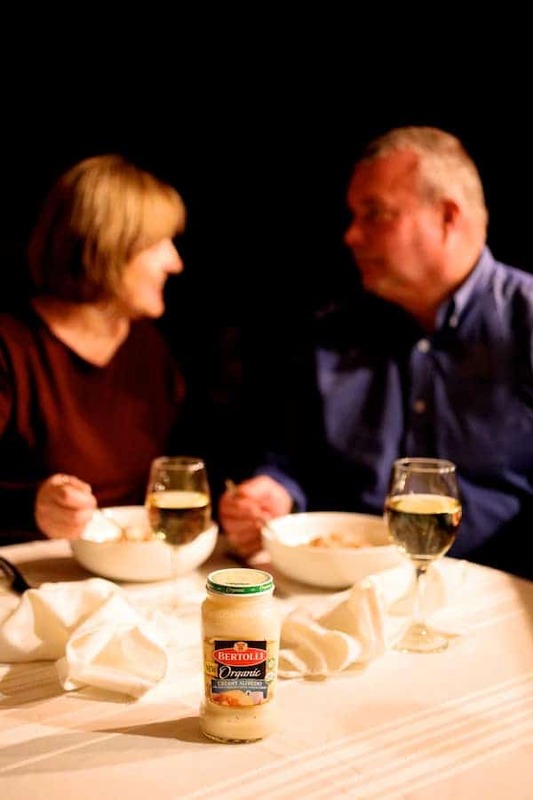 Bertolli® sauce helps you create the perfect romantic dinner for two! Easy enough for a weeknight, special enough for date night! Cook the bacon in a skillet or saute pan until crisp. Drain on paper towels. Reserve 1 tablespoon bacon drippings in the pan. Bring a pot of salted water to a boil. Cook the pasta until al dente per package directions. Drain. Place Bertolli Alfredo sauce in a small saucepan. Add the garlic, sun-dried tomatoes and crushed red pepper flakes. Bring to a simmer. Add all but a few pieces of the bacon to the sauce, reserving the remainder for garnish. Place cooked pasta in the sauce and toss to coat; keep warm. Season sea scallops with salt and black pepper. Heat reserved bacon drippings back up over medium-high heat. 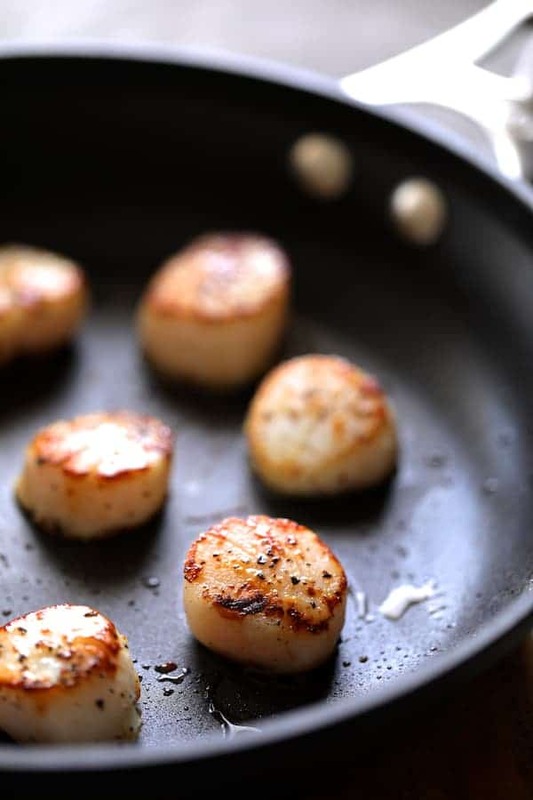 Place scallops in the pan and sear 2-3 minutes on the first side and 1 minute on the other side. Remove from heat. To serve: Place equal servings of the pasta in bowls. Top with 4 scallops each. Garnish with reserved bacon pieces, freshly grated Parmesan cheese and chopped fresh parsley. Pasta with Alfredo sauce is always on the top of my list! + your pictures look so beautiful! I was just browsing scallop recipes seeking ideas – I’m so glad that I came across this one! Looks fabulous as usual, Carol. 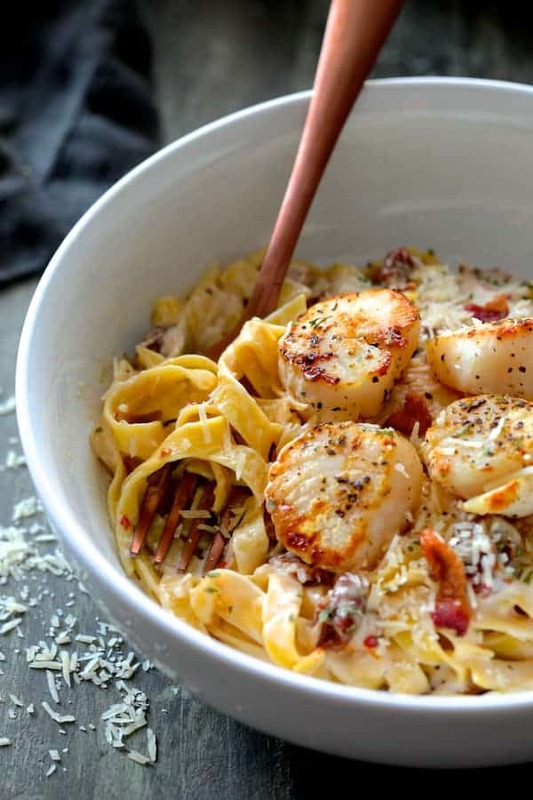 I love all the flavors you’ve got going in this dish… scallops, bacon, alfredo, oh my! I’ve never been to Italy myself, so this sounds exactly like the culinary trip I need! I have been yearning for a trip to Europe as well! I love this recipe you created and it’s so helpful having a pantry stocked with goods made with real whole food too! Bertolli is my absolute FAVORITE brand!! And got back to Europe…go…GO! Don’t think twice about it! Life is too too too short so you need to go while you can! But seriously – this recipe looks amazing. Perfect for a Valentine dinner at home for 2! Thanks for posting this!! We have been to Northern Italy a few times (with Florence as south as we have been), but really want to get back! And how cool that you went with chefs. Such a neat sounding experience. I think it was two years ago my mother spent a whole month in the south of Italy taking a class on restoring, and helping to restore, artwork. Like they worked in old caves and it sounded so neat. So many cool things to do in this here life of ours… just not enough time. This pasta dish looks lovely! I love the addition of sun dried tomatoes and bacon with the Alfredo sauce. My husband will love this. I can’t wait to make this for him. 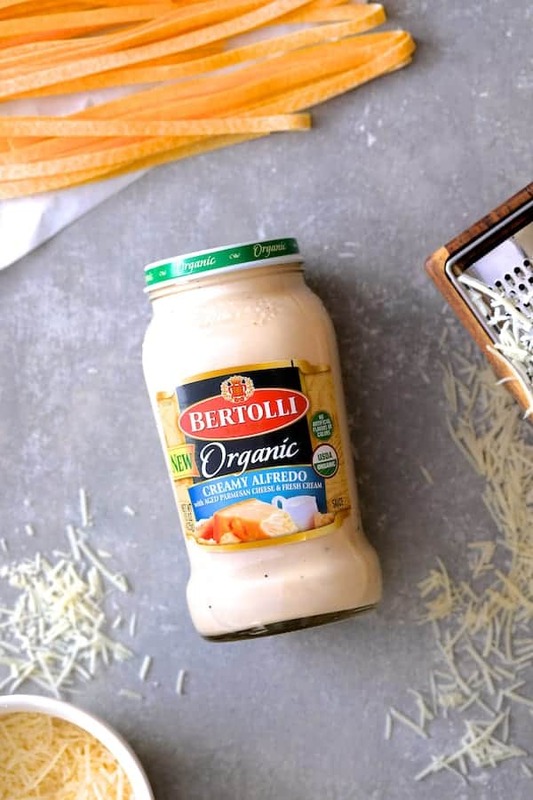 Using Bertolli Organic Alfredo Sauce will make it so easy. This dish looks so incredibly delicious! I know just what you mean about Italy and missing out on places! My husband and I went to Paris and didn’t go up the Eiffel Tower because the lines were so long and we didn’t buy ticket in advance! But that was 9 years ago and we just booked tickets to go this April and take our daughters with us! I hope you get to make it to Italy again this year! I love scallops and can’t help but buy them whenever they’re fresh at the seafood market. Always looking for new scallop recipes! That creamy sauce must be fantastic with them. Thanks, Dominique! It’s a really great, easy dinner we love!